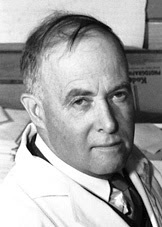 James B. Sumner, born on November 19, 1887 in Canton, MA, was the first person to isolate an enzyme. While he was growing up he was an avid hunter and lost his right arm below his elbow in a hunting accident. Having been left handed, this forced him to adapt to using his right hand to do things and this effort allowed him to become an expert at tennis, skiing, billiards and clay-pigeon shooting. As an undergrad at Harvard College he specialized in chemistry. He then went on to study Biochemistry at Harvard Medical School from which he obtained his Ph.D. in 1914. Offered an assistant professorship at Cornell Medical School he went there where he was made a full professor in 1929. His research at Cornell centered around analytical methods, but despite hard work he was unable to obtain any interesting results. He then decided to try to isolate an enzyme, a feat which until then many of his colleagues thought was impossible. In 1921, when he work was still in the early stages he received a fellowship to travel to Belgium. He wanted to go there to work with Jean Effront, who had written several books on enzymes, however Erront thought the idea of isolating an enzyme was ridiculous, so the trip fell through. In 1926 he finally succeeded in isolating the enzyme urease. Many biochemists disbelieved or ignored his results, but in 1929 it brought him a full professorship. In 1929 John Northrop of the Rockefeller Institute isolated pepsin and subsequently other enzymes it became clear that Sumner had developed a general method for isolating enzymes. Other biochemists gradually were forced to admit Sumner's claims were correct. For his work demonstrating that an enzyme could be isolated Sumner, along with Northrop, were awarded the Nobel Prize for Chemistry in 1946. Sumner's work demonstrated that enzymes were proteins, which at the time was controversial. Enzymes function as catalysts in biological systems. They allow chemical reactions, particularly those of metabolic pathways, to occur much faster than they would under normal conditions. Enzymes speed chemical reactions by lowering the activation energy required for a reaction to occur. Enzymes are also specific, in that they will only catalyze a specific chemical reaction. For example Urease (the enzyme isolated by Sumner) catalyzes the conversion of urea into carbon dioxide and ammonia and it occurs in bacteria, yeast and some higher plants. An article with more information about enzymes can be found here. For his research in isolating enzymes, James Sumner is the Dead Scientist of the Week for the Week of November 15-21, 2009.